These aerial platforms are ideal for working on height from 12 meter (40ft) up to 48 meter (156ft) requiring no obstructions. Straight boom lifts are more versatile with longer horizontal reach. 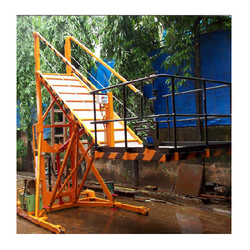 Kaushalpati Infra equipements offers straight boom lifts for sale and rent from 40ft to 150ft. We are a leading supplier of Industrial Boom Lift, We are the prominent supplier of superior quality Industrial Boom Lifts that is used for lifting or lowering a load . The offered product is manufactured by our professionals using optimum quality components and sophisticated technology as per the set industry norms. Axio Infra Equipment & Rental Pvt. Ltd.
From 30 feet to 150 feet, JLG Boom Lifts can get you there. Offering a full range of Straight and Articulating Boom lifts with factory-designed accessories, you can be more efficient and productive than ever. Since 1969 when founder John L. Grove invented the first self-propelled boom lift, JLG has been working hard to find ways to make your job easier and safer. NANDAN's Truck Mounted Articulated Boom Lift is a popular choice for lifting and placing heavy equipment in the oil field support business and the construction industry. Platform Basket s.r.l. is world’s leading manufacturers of Spider Boom Lift / Atrium Lifts and have machines in all power options and combinations. AC, DC, Diesel, Dual Power with any of these combinations. 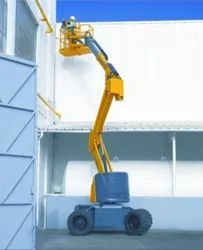 We have trained staff to work on the boomlift to clean facades where spiderman technique or other techniques are not feasible. boom lifts or cherry picker & other construction machinery available on rental in any where in india.